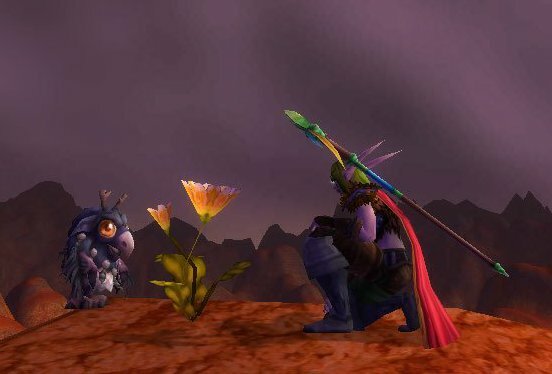 Azerothian Vignettes: In which the moonkin hatchling "helps"
In which the moonkin hatchling "helps"
"Oh no!" the druid shouts as two wolves circle round to attack her while she busily tries to contend with her current enemy, one very large and angry kodo. Feathered arms wave quickly casting thorns and barkskin on herself, she glares down at the tiny moonkin hatchling at her feet, her mini-me if you will. "You know, you could be helping!" she grumbles, as she goes on to pin one of the wolves with an entangling roots spell. The kodo goes down with a mammoth groan, and the druid finishes off the wolves with a couple more casts of nature's wrath. She shifts back into her normal elven form and after checking herself over for serious wounds and wiping the sweat from her brow, she glances again to the moonkin, only to find it has cast the one spell it knows in an effort to help, a tiny yellow flower coming up from the ground at it's feet. She can't help but chuckle and pat the little creature on the head, as it looks up at her for approval with huge moonkin eyes.